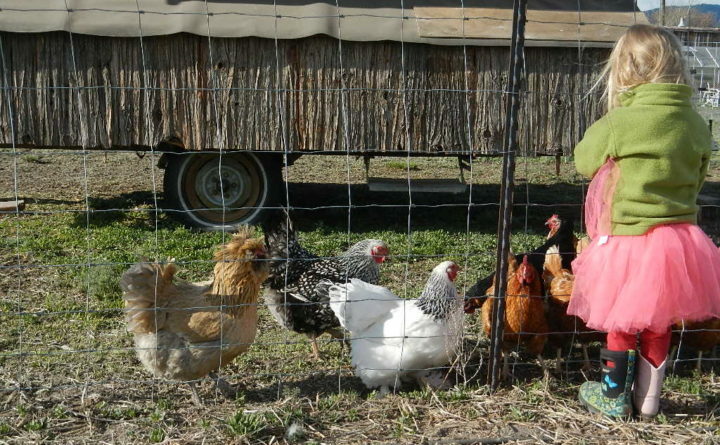 The daughter of Annie and Walter Bernauer feeds the chickens on her family's homestead in Montana. Annie Bernauer is the author of the popular bog "Montana Homesteader." The garden needs to be weeded and watered. The chickens need to be fed. There’s butter to churn and bread to bake. When the to-do list seems a mile long, it’s easy for parents to shoo away their children so they can complete chores as efficiently as possible. Yet homesteaders around the country caution against this tactic. Involving children in day-to-day tasks and projects on a homestead, they said, is important and rewarding in many ways. “Just slow down, even if it means you get less done,” said Carolyn Thomas, who lives on a homestead in North Idaho with her husband Josh Thomas and their nine children, ages 1 to 13 years old. Authors of the successful Homesteading Family blog and Homesteading Family YouTube channel, Carolyn and Josh Thomas live on a 40-acre farm. They raise livestock for meat and dairy products, and they grow almost all of the vegetables, fruit and natural medicines they consume, as well. Through their writing and videos, they share with the public all they have learned — and continue to learn — about living more sustainably and closer to the land while raising a large family. In the Thomas household, helping with home chores starts at a young age with a simple task: sorting and putting away the clean silverware. And as the children grow older, they’re trusted with more complex and important jobs, such as collecting eggs, milking cows and growing vegetables. There isn’t any set age a person has to be for these more complex chores. Instead, they evaluate each child’s ability to follow directions and handle tools on an individual basis. They also consider each child’s interests. While one may be fond of caring for the chickens, another may be more interested in planting medicinal herbs and cut flowers. When your toddler is uprooting your pole beans, allowing your child to participate in gardening can seem like a bad idea, but the Thomas family came up with a solution. When their first child, Tristan, turned 3 years old, they assigned him a specific area in their garden where he could dig for worms, pull up plants and scatter seeds. Meanwhile, they tended the crops nearby. And in time, Tristan learned to cultivate plants of his own. Hundreds of miles away, this strategy of designating a garden space for children is also used by Annie Bernauer, author of the popular blog “Montana Homesteader.” In her garden, she creates a kids area, where her two children can grow whatever they want. In her blog, Bernauer offers tips for gardening with small children, which include keeping a stash of toys by the garden and allowing children to help pull weeds as they get older and learn to differentiate between plants. Bernauer said she was surprised at how quickly her daughter has learned how to tend their gardens, and how now she has started saving and drying seeds from vegetables and fruits throughout the year so she can plant them in her garden in the spring. Growing trees is another great activity to kids, said Jenna Smith of Shady Pines Homestead in north central Arkansas. She estimates that she and her husband have planted about 100 trees on their property in the Ozarks with their 3-year-old son, Neo. Caring for animals can help teach children greater compassion for living creatures, as well as foster an understanding about where food comes from. And as children grow older, working with livestock can also lead to thinking about more complex topics, such as life cycles and biological processes. But perhaps most importantly, working with animals is fun, and there are plenty of animal-related chores that are easy enough for even the youngest homesteaders. When working with chickens, it’s important to teach children not to put their hands in their mouth or rub their eyes, said Lisa Steele, author of “101 Chicken Keeping Hacks” and other poultry-related books.” Chickens can carry salmonella, even if they appear clean and healthy, and that bacteria can be easily transferred to people by touch, causing illness. However, if you are strict about washing your hands after handling chickens, Steele said that chicken coop chores are great for kids. Another good chore for older kids is milking, according to the Thomas family. Over the years, Josh and Carolyn Thomas have learned that while toddlers are excited about helping with just about any task on the farm, children can sometimes resist the idea of “work” as they get older. To steer clear of this mentality, Carolyn and Josh Thomas have a few strategies. In addition, on the Thomas homestead, no one person is saddled with the thankless job of nagging everyone else to complete their chores, and that’s because they’ve established a schedule and solid expectations for everyone in the family. While allowing children to take ownership of chores and projects on a homestead may actually result in more work sometimes, especially when the children are young, the Thomas’s believe that keeping the entire family involved is key to running a successful homestead. Not only does the work teach their children lessons and skills, it forges lasting memories.